Robyn Goldberg is a registered dietitian nutritionist, certified eating disorder specialist, certified intuitive eating expert and a Health at Every Size® (HAES) clinician. Robyn has spent years learning from some of the best in the industry and continues to seek professional mentoring, attends innovative conferences and stays abreast with the most current literature. Robyn began her career at Cedars-Sinai Medical Center in Los Angeles as the in-patient dietitian in the Department of Cardiology. For the last 21 years, Robyn Goldberg has had a private practice in Beverly Hills, CA, where she specializes in medical conditions, disordered eating, eating disorders, dual diagnosis, preventative nutrition and athletes maximizing optimal nutrition. Robyn promotes an opportunity to excel in personal health and fitness maintenance through a lecture series in association with several medical groups. She consistently instructs professionals, students and RDs about how to best incorporate intuitive eating and Health at Every Size® approaches into their work and lives. She teaches nutrition classes on a wide array of topics for the Motion Picture Industry’s Wellness Program. Actively involved in the nutrition and body positive community, Robyn is also a member of organizations including: Association of Size Diversity and Health and The International Federation of Eating Disorder Dietitians. She also serves as a Nutrition Consultant for the Celiac Disease Foundation. Robyn also leads several body image and eating disorder groups in sober living settings in the Los Angeles Area. 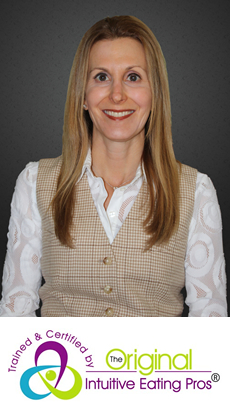 Robyn is a nationally renowned contributing author registered dietitian nutritionist. She has been quoted as an expert in various publications including The New York Times, The Huffington Post, Diabetes Forecast, Shape Magazine, Fitness, Oxygen, Life & Style, Natural Solutions, Beverly Hills Weekly and Today’s Dietitian. In addition, Robyn has also served as an eating disorder specialist on the nationally televised show “The Insider” and an expert on The Associated Press (AP). Robyn works with the non-diet approach in helping her clients become connected to “physical” hunger vs. “mouth” hunger. This approach is also known as Intuitive Eating. Reconnect and restore your innate ability to self regulate your eating and nutrition without having diet rules, guilt, shame and judgement after eating. The goal of intuitive eating is to be able to tap into an inner knowing of what, when and how much to eat for a person at any given time, with being able to be spontaneous or having any conscious reasoning. The body always knows what it needs for nourishment, but these signals somehow have become lost and we have to relearn how to reorient ourselves to what our body tells us instead of what others tell us what we should or should not eat. Robyn evaluates all pertinent blood laboratory values, exercise regimen and dietary preferences, all on an individual basis. Anyone can claim the title “nutritionist” without regard to what qualifications they may possess. However, there are those who have amassed the education and practical experience to truly merit the title: Registered Dietitian Nutritionist. Robyn Goldberg is an outstanding member of the latter group. An RDN who earned her degree in dietetics at California State University Northridge. Goldberg has gone on to private practice in Beverly Hills as well as inpatient clinical practice at the world-renowned Cedars-Sinai Medical Center. Inspired by her desire to provide long-term nutritional solutions for her patients, Goldberg was motivated early on by the chronic condition of a close family member who suffered from coronary artery disease and her own desire as an athlete to maintain a healthy body weight. She recognized that long-term health could result from permanent lifestyle changes, not superficial “quick-fix” solutions. Goldberg now applies that philosophy to her patients, treating them with a combination of individualized therapeutic diets, fitness regimens and compassionate counseling. Goldberg’s healthful endeavors extend outside of the clinical setting as well. She serves as a Nutrition Consultant for the Celiac Disease Foundation as well as an Advisory Board Member for the Healthy Dining Restaurant Guide. She has contributed articles to enutrition.com and addictionsolutions.com and her specialized classes, conducted for the Motion Picture Wellness Program, Universal Pictures, and other private and public institutions, regularly sell out. From clinic to classroom, Goldberg is that rare combination of articulate expert and telegenic personality that makes her a sought-after commentator, educator and writer. Goldberg is a nutrition therapist who has truly earned the credentials and compassion to truly make a difference in her patients lives.